It’s your birthday and I made you a cake. This would be a cinch in most families, but we live in the land of the gluten-free or dairy-free, and sometimes both. Not by choice so there’s no room for mistakes. I am developing a pretty good repertoire of cakes, and even some bread, which use almond meal as well as alternative flours, from quinoa to brown rice. I tend to like recipes that use the “other” flours for what they are and not simply as a substitute for white wheat. 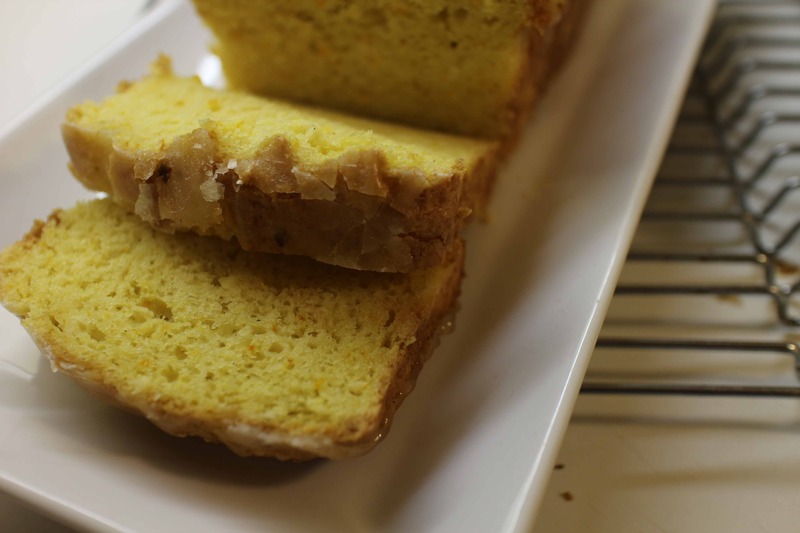 However, I’ve been considering how to make a gluten-free citrus pound cake, one that will support a pile of strawberries when they return to season in a couple of months. This was the perfect opportunity to use the gluten-free flour mix called Cup 4 Cup, which was developed by Thomas Keller of French Laundry fame. I haven’t been a big fan of pre-mixed GF flour mixes until now. Given the ingredients of this particular cake, I thought it might work. There’s something magical that sour cream, buttermilk and yogurt do to batter when combined with baking soda. Orange peel, like cooked pumpkin, has a similar effect.This cake was amazing. It rose a mile high and had great crumb. I baked it in two medium loaf pans and halved the glaze since I thought it would benefit from a little crunch on top but didn’t need more sugar. So when the strawberries arrive, I’m going to make two versions, GF and conventional, just for fun. And because I am as nerdy about food experiments as America’s Test Kitchen. Side note: you can use larger or smaller pans and adjust the baking time as I indicate in the recipe. Thoroughly mix together the sour cream, orange juice, vanilla, and orange liqueur if using, and set aside. Place the sugar and orange zest in the bowl of an electric stand mixer with the paddle attachment, or in a medium-large bowl if you are using an electric hand mixer, and beat the sugar-orange mixture on low speed until well combined. Drop in the butter, about 2 tbsp at a time, until well combined. Increase the mixer speed to medium-high and cream the mixture until it is light and fluffy, about 5 minutes. (Do not shorten this step or your cake could be a little flat and dense.) On low speed, add the eggs one at a time, beating well after each addition. Spread in prepared pans, smoothing the top. The mixture made with gluten-free flour may seem quite thick. Let the cake cool for 10 minutes before removing it to a rack to finish cooling. While the cake is cooling, make the glaze by combining the confectioners’ sugar and orange juice in a small pan. Bring it to a boil, stirring, lower the heat and simmer it for 2 minutes. Brush or pour the glaze over the cakes and cool them completely before serving. 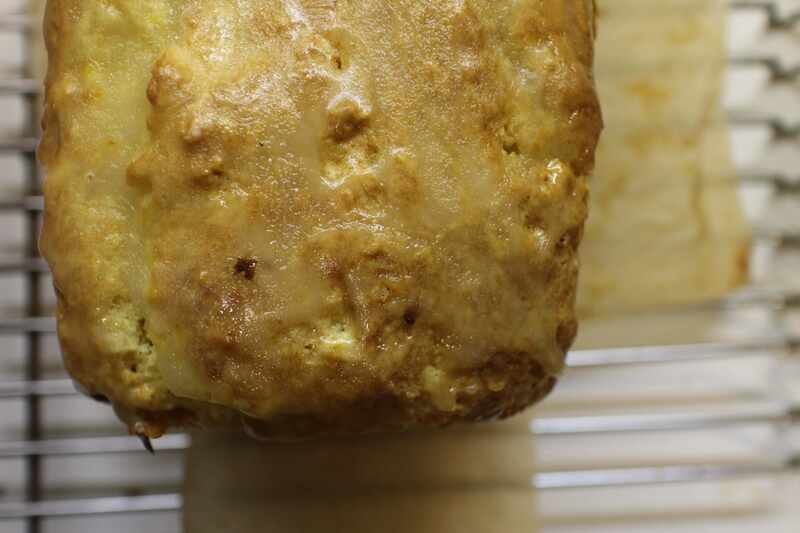 Makes 2 medium loaf cakes (or 1 large one or 8 minis).